2018 is the Year of the Bird, and in April, birds really need your help! The Year of the Bird celebrates the 100th anniversary of signing into law the Migratory Bird Treaty Act which has protected billions of birds on migration – from Peregrine Falcons to Magnolia Warblers, finches to orioles, hummingbirds to thrushes — from accidents and death. But there is legislation in Congress right now (HR 4239) which threatens to eliminate the protections for migratory birds by, among other things, eliminating penalties for companies that kill substantial numbers of birds, including those affected by large oil spills. 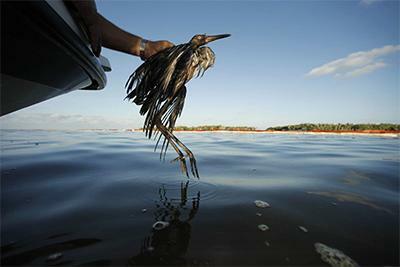 So, in the next oil spill, for example, the company responsible would have no obligation to provide any cleanup or rescue for any birds, leaving birds like this heron (pictured above being rescued), without any help. The proposed changes to the act could have a devastating effect on migratory birds – many of which like finches, wrens, sparrows and orioles – visit our backyards. This article in the Washington Post gives a good summary of the issue. Wondering what you can do? An easy way to help is by sending a message to your Congressional Representative telling them you want the MBTA to remain in place and intact. It’s simple to do and gets the message to the right people. You will have the chance to personalize the message and send directly to your representatives which will be listed on the page so you can easily choose them to receive your email comments. Let your representatives know that a reinterpretation of or change to the protections provided in this act isn’t what you want. And be informed when you speak with others about this issue by finding out more about the Migratory Bird Treaty Act and its significance in keeping the birds we look forward to seeing every spring, safe on their journeys — check out this analysis and opinion piece. Don’t let birds like this heron above, or the orioles or finches which visit your feeders be abandoned in an emergency. Send the letter to our Congressional representative and let your friends know about the issues at hand.